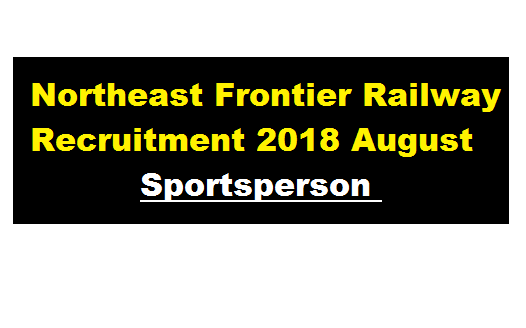 Northeast Frontier Railway Recruitment 2018 August – Sportsperson:- Northeast Frontier Railway has recently issued recruitment notification for August 2018 and the vacancy is in sports category. According to NFR Recruitment 2018 August, Applications are invited from eligible citizens of India for appointment of sports persons through open advertisement against the various sports discipline in Northeast Frontier Railway. We have discussed in details about this railway recruitment 2018. In this section, we will discuss in detail about Recruitment for sportsperson under Northeast Frontier Railway Recruitment 2018 August with all the details and requirement. (a) Minimum 18 years and maximum 25 years as on 01.01.2019 (between 02.01.1994 to 01.01.2001). No relaxation in lower or upper age limit will be permissible. (i) Trial of sports performance. (ii) Interview and assessment of sports achievement, educational qualification etc. Candidates fulfilling the eligibility criteria should apply as per application format given at Annexure-A by the candidate in his/her own handwriting on a good quality A-4 size plain paper along with two recent (taken within last two months) passport size photographs duly self-attested without wearing any wig, cap or coloured glasses. The application should be duly filled and signed by the candidate in own handwriting. The envelope should be superscribed “RECRUITMENT AGAINST SPORTS QUOTA:: EVENT – …………………… & GP – …………………” with the name of the event.